The subject of miracles can be quite an imposing and difficult topic. How do you define a miracle? Who decides when a miracle has happened or what qualifies as a miracle? Are miracles within our control or can we prepare ourselves somehow to receive or at least recognize miracles in our lives? Tough questions. The talks referenced in this article are listed at the bottom of the page. It is most remarkable to witness one who is deaf made to hear again. But surely that great blessing is no more startling than the wondrous combination of bones and skin and nerves that lets our ears receive the beautiful world of sound. Should we not stand in awe of the blessing of hearing and give glory to God for that miracle, even as we do when hearing is restored after it has been lost? If the gift of hearing is a miracle then how many other things that we take for granted each and every day should we also consider miracles? That would have to include things like our sight, the various cycles of nature that regenerate the planet and make it self sustaining, the ability of our cells to repair themselves, and so much more. The regular order and pattern of the stars and planets have been declared to be testaments that there is a God. In short, if we take a good look around us and try to explain all the wondrous patterns we seen in the natural order of things, we will be hard pressed to rationally chalk it all up to random chance. There is just too much order and too many repeating patterns to call it all chance. I called these self evident miracles, but how many of us have studied them for years in school yet still don’t give all these natural wonders a second thought? After all, isn’t that just the way things are? What is so special about that? I put these natural wonders in the same category as the love and service we receive from those who love us most. We tend to take them for granted also, at least we do until they are taken away from us and we finally realize how valuable they were in our lives. These self evident miracles are only appreciated when we consciously work on being grateful for them. This is why we need to tell those whom we love the most that we love and appreciate them. We need to regularly practice acts of gratitude to demonstrate and keep alive within ourselves a sense of appreciation for how fortunate we are. This would be a good place to read the words of the hymn Count Your Blessings. It is because of this type of miracle (the self evident ones) that I named this article “Miracles Require Sight.” We don’t have to have physical sight to see a miracle, but we do have to be willing to acknowledge that the Lord is working daily in our lives to accomplish his will, which is to accomplish our eternal salvation and exaltation. Everything God does is for our benefit and prosperity. Even our trials can be made into powerful teaching opportunities that help us learn lessons that would be difficult, if not impossible to learn in any other way. The question is, do we have the ability to see the Lord’s hand in every part of our life, guiding, helping, and instructing us? Are we willing to seek the Spirit’s help in recognizing how fortunate we are, no matter how dire our physical circumstances? I am grateful for a teacher who encouraged his students to keep a journal of the whisperings or promptings of the Spirit in their lives. He directed us to note what we felt and what resulted. Little things became evident. One day I was frantically trying to complete some assignments and prepare for a trip. I had just been down to the laundry area of the dorm to move my clothes from the washer to the dryer. Unfortunately, all the dryers were in use, and they all had many minutes to go. I went back upstairs discouraged, knowing by the time those dryers finished, I had to be on the road. I had barely returned to my room when I felt prompted to go back downstairs and check the laundry again. Foolishness, I thought—I had just been there, and I didn’t have time. But because I was trying to listen, I went. Two of the dryers were empty—and I was able to meet all my commitments. Could the Lord possibly have been concerned about smoothing my way in such a small but, to me, important matter? I have learned since through many such experiences that the Lord will help us in every aspect of our lives when we are trying to serve Him and do His will. I will state here that I do not believe that coincidences exist. We will be far better served if we simply choose to believe that God is actively working in our lives because he loves us. I fully expect that the day will come in the hereafter that we will finally see just how involved our Father has been in our lives, and we will be forever grateful for his mindfulness of our well being during our time in mortality. It will be just one more evidence of his never-ending love for us. Elder Hallstrom started his talk with a story of a man who fell from a 40 foot cliff then slid/rolled 300 feet down a mountainside. Here is his account of the miracles that happened that day in this man’s life. The miracles Clark experienced during this traumatic event were just beginning. Some of the first to reach him “happened” to be a group of hikers that included mountain rescue guides and emergency medical professionals. They immediately treated Clark for shock and provided gear to keep him warm. This group also “happened” to be testing a new communication device and sent an emergency request for help from an area where cell phones could not get a signal. A small helicopter was immediately dispatched to Mount Shasta from an hour away. After two dangerous but unsuccessful attempts to land at an altitude that pushed the limits of the aircraft, and struggling with treacherous wind conditions, the pilot began a third and final try. As the helicopter approached from a different angle, the winds “happened” to change and the aircraft landed just long enough for the group to quickly and painfully squeeze Clark into the small compartment behind the pilot’s seat. 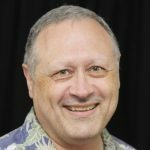 When Clark was evaluated at a trauma center, tests revealed that he had sustained multiple fractures in his neck, back, ribs, and wrists; a punctured lung; and a multitude of cuts and abrasions. A renowned neurotrauma surgeon “happened” to be on duty that day; he is at this hospital only a few times a year. This doctor later stated that he had never seen anyone sustain so much damage to the spinal cord and carotid arteries and live. Clark was not only expected to live but to return to full function. Describing himself as agnostic, the surgeon said Clark’s case went against all his scientific learning about neurological injuries and could only be described as a miracle. We each have to decide if Clark was just lucky or if he had a divine hand sustaining and helping him that day. What are the odds that so many amazing coincidences could all occur one right after the other on the same day? So what will it be, luck or the hand of a loving Father in Heaven? And if He will step in for Clark, does he step in for each of us? The question is, are we willing to “see,” that is acknowledge, his hand in our lives, even in the little things? Some miracles, or intervention on God’s part, require preparation on our part. The problem is we don’t know when these miracles might occur. Mixed up in this whole issue is the principle that we need to rely on God’s timing and plan for us. We don’t know either his timing, nor his plan for each of us. Elder Hallstrom talked about a couple of good, righteous families who went up in a plane, which crashed. Just two months ago, two temple-recommend-holding married couples, with three full-time missionary children and five other children between them, took off in a small airplane for a short flight. I am confident they prayed for safety before the flight and prayed fervently when their aircraft encountered serious mechanical problems before crashing. None survived. What about them? Why did the Lord allow them to crash? We don’t have the answer to questions such as this when people suffer, seemingly for no apparent reason. Could he have saved this family? Of course. Only he knows why he allowed the natural order to proceed without interference. Only he knows what lessons needed to be learned by all involved, and only he knows what those who died need to do on the other side of the veil. We see only what is happening in mortality, but to God mortality and the spirit world are all part of the same experience. We can’t make judgments when we see only half of the picture. He sees all of it, for he created it. Some miracles are a direct result of faith. We always teach that faith is a principle of power, and miracles is just one of the direct results of having faith. Mind you, that doesn’t mean that because we have faith we can dictate where, when, or how miracles are dispensed in our behalf. We still have to rely on God’s timing and knowledge of what is in our best interests. But having faith that God can work the miracle if he chooses to do so is an important first step. Here is what Moroni says in Moroni 7:33-37. So without belief and faith our lives are lived in vain, for no salvation is possible without them. And with faith all things are possible that are “expedient in me.” It is still, as it has always been, up to the Father to decide when circumstances will be changed for our benefit. We must always rely on his absolute love and wisdom to dictate such things. Elder Hallstrom related a story about Elder Bednar in his talk. Elder David A. Bednar once asked a young man who had requested a priesthood blessing, “If it is the will of our Heavenly Father that you are transferred by death in your youth to the spirit world to continue your ministry, do you have the faith to submit to His will and not be healed?” Do we have the faith “not [to] be healed” from our earthly afflictions so we might be healed eternally? Holly and each of the five beautiful children who sat in the living room around their parents have such faith that they could have accepted whatever the outcome might have been that day and they still would have spiritually prospered. How does this affect our ministering? First of all, miracles and timidity cancel each other out. 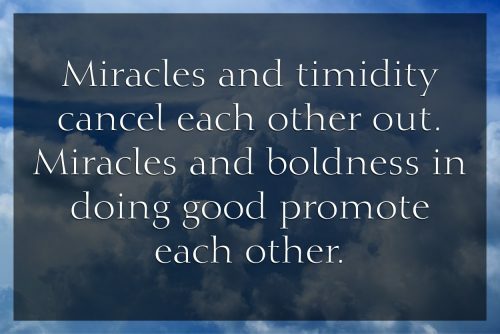 Miracles and boldness in doing good promote each other. President Thomas S. Monson said, “The greatest force in this world today is the power of God as it works through man.” This is what ministering is all about. 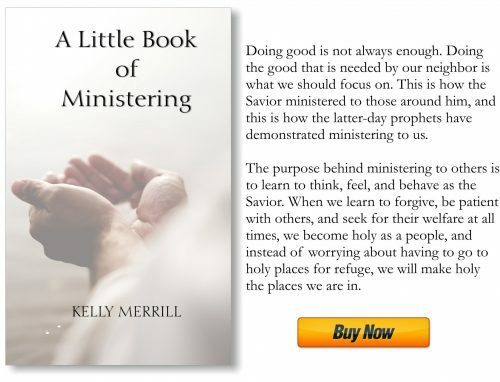 As we minister to the needs of those around us we are doing good, which is the power of God. His love is his defining trait, and that love is evident most clearly by the good he does. The same holds true for us. We cannot love without doing good, and doing good is what we do when we minister to others. The call to serve has ever characterized the work of the Lord. It rarely comes at a convenient time. It prompts humility; it invites prayer; it inspires commitment. The call came—to Kirtland. Revelations followed. The call came—to Missouri. Persecution prevailed. The call came—to Nauvoo. Prophets died. The call came—to the basin of the Great Salt Lake. Hardship beckoned. That long journey, made under such difficult circumstances, was a trial of faith. But faith forged in the furnace of trials and tears is marked by trust and testimony. Only God can count the sacrifice; only He can measure the sorrow; only He can know the hearts of those who serve Him—then and now. Recognize here that it is because they were obeying the commandments of the Lord that when situations became extreme and oh so difficult that they experienced all the miracles their stories are known for. If they had stayed back east and had not accepted the call of the Lord to do hard things, you can be guaranteed they wouldn’t have had the miracles in their lives, for the faith would have been absent. It is true that faith precedes the miracle. In Doctrine and Covenants 64:29 we are reminded that when we keep the Lord’s commandments we are actually on the Lord’s business. It is a truth that when we are on the Lord’s errand, his business, that there is no such thing as failure. We can and should expect miracles to happen, if it furthers the Lord’s work. Normally, when we are ministering to others, all we can do are the little simple acts of kindness that mark a disciple of Christ. But it is an eternal truth that it is through little things, through simple things that the Lord brings to pass great things. Have faith that this will happen. Expect it. Here is President Monson’s admonition for our ministering. Let us recognize and respond to the needs of the widow; the cry of the child; the plight of the unemployed; the burden of the sick, the confined, the aged, the poor, the hungry, the lame, and the forgotten. They are remembered by our Heavenly Father and His Beloved Son, Jesus Christ. May you and I follow Their divine examples. Now, we know, as you do, that all petitions to the Lord and all fasts do not receive this same hoped-for answer. Our extended family also has faced the death of loved ones, serious illness, the trial of divorce, and children who are choosing another path. We do not always understand the reasons behind the tests that come with mortality. But our faith has grown, and perhaps yours has too, as we have watched loved ones, friends, and people we know only by reputation endure with faith in the Lord the most severe trials. They, too, know the God of miracles and witness in their extremity that whatever the future holds for them, the Lord knows them and loves them and is blessing them. They are sealed to Him and to each other forever, and they are willing to submit their wills to His. How have they come to such a point? How do we access the quiet miracle that the Lord works as He transforms us, His children, into worthy heirs of the kingdom of God? I believe it is made possible because “God so loved the world, that he gave his only begotten Son, that whosoever believeth in him should not perish, but have everlasting life” (John 3:16). I believe it comes as we yield to the enticings of the Spirit, put off the natural man, and are filled with the love of God (see Mosiah 3:19). “Through the Atonement of [Jesus] Christ, all mankind may be saved, by obedience to the laws and ordinances of the Gospel” (A of F 1:3). All mankind—that includes me, that includes you—we can each have part in the Atonement, the greatest of all God’s miracles.